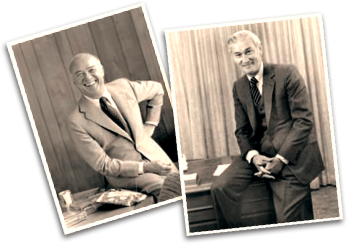 In 1957 Wallace and Harrison McCain, along with their brothers Robert and Andrew, founded McCain Foods, opening the first production facility in their hometown of Florenceville, New Brunswick, Canada. Under Wallace and Harrison’s leadership, McCain Foods quickly established itself within the Canadian marketplace and then began a journey to become the world’s largest manufacturer of frozen French fries and potato specialties. 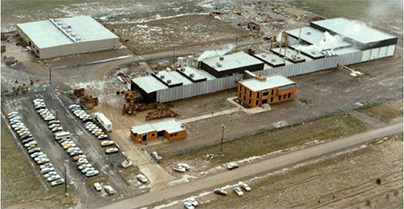 McCain Foods Limited was incorporated in 1956 and the brothers’ first French fry plant started up in 1957 with 30 employees. 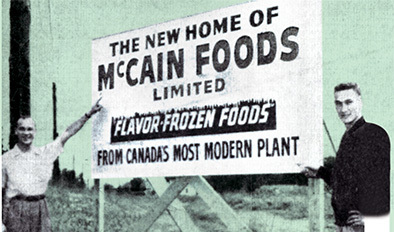 The 1950s saw a surge of growth in frozen and convenient food options and McCain was soon a household name and a global leader in food products. Today, McCain Foods Limited operates across six continents with 45 sites, working with 3,200 farmers and use over 6.5 million tonnes of potatoes every year. McCain Foods (Aust) Pty Ltd and McCain Foods (NZ) Limited are both wholly owned subsidiaries of McCain Foods Limited in Canada and are part of the global McCain group of companies. A Timeline History in Australia. In 1968 McCain Australia was set up as a division of McCain Foods Limited, importing French fries from overseas. With the fertile potato growing conditions in Victoria and frozen potato industry in infancy, it was obvious to McCain Australia to purchase potato farms and build a production facility. A small potato processing plant was built in Daylesford to manufacture frozen fries. Delicious and fresh, the fries were such a hit that we soon needed a new plant. And Ballarat, with its potato growing reputation, was where we built in 1974. As the Ballarat plant cooked up batch after batch of golden fries, the original Daylesford plant got a makeover to manufacture the latest product – pizzas. No one thought they’d be as popular as they were, and we were soon constructing another plant in Ballarat, just to produce pizza. 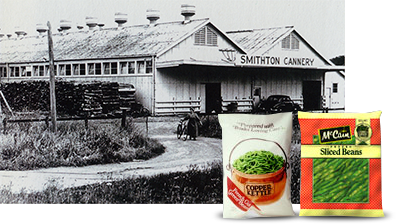 In 1984 we purchased the Copper Kettle Vegetable Processing Plant in Smithton, Tasmania. And we expanded our products from fries and pizzas to include farm-fresh vegetables. But there was more to come. In the same year, McCain Dinner Classics burst onto the market, with a range of low calorie, fresh dinners that the whole family could enjoy. McCain gradually welcomed Chalet Foods, Gold Crest and Milani dinner products, into the family. This allowed us to offer a substantial variety of frozen dinners, including Low Calorie, Heart Foundation Approved, and our Healthy Choice range. In 1988, another potato processing plant was built in Smithton and Tasmania’s cool climate produced our best potatoes yet. 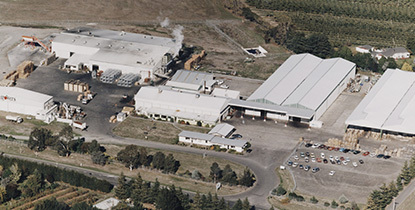 In 1990 we purchased New Zealand’s Alpine Food Co – a vegetable processing company in 1992 we bought the Safries potato processing plant in South Australia. New Zealand now joined the ranks of McCain fans around the world. 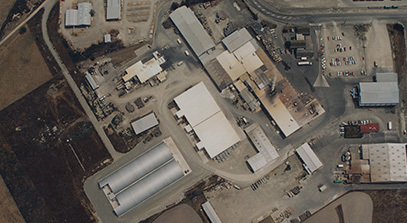 We built a potato processing plant in Timaru, right next door to the existing vegetable plant. With freshness as their number one priority, New Zealand now had McCain produce from their very own farmland. In the late ‘90s McCain began to blossom into the organisation it is today. Multi-million dollar upgrades to the original Ballarat French fry plant saw epic leaps in production volumes. We tripled the size of our dinner manufacturing plant and installed a state of the art cold storage area in Ballarat. 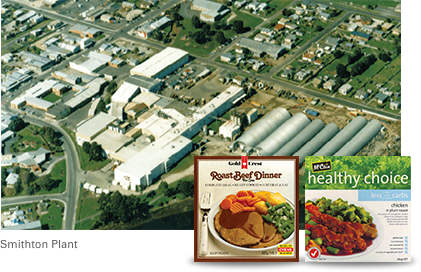 The first decade of the new century has seen a new dinner manufacturing plant and substantial upgrades to the vegetable plant in Hastings, NZ. Robotics was introduced into three of our plants, and we developed a range of delicious frozen fruits and sweet potato fries. 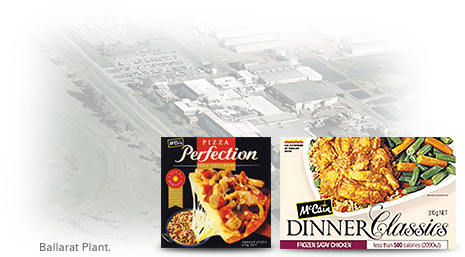 In 2013, McCain Foods (Aust) Pty Ltd acquired Kitchens of Sara Lee Pty Ltd, further growing its portfolio of products with the addition of bakery, frozen desserts and ice cream.Since 1968, McCain has shown that if you produce the best quality food, you’ll soon become a trans-Tasman favourite. Especially when you maintain an unwavering pledge to ensure the highest quality in food safety, sanitation, ingredient quality and manufacturing integrity. From the farm to your table, McCain promises to deliver delicious, tasty and nutritious produce for years to come.